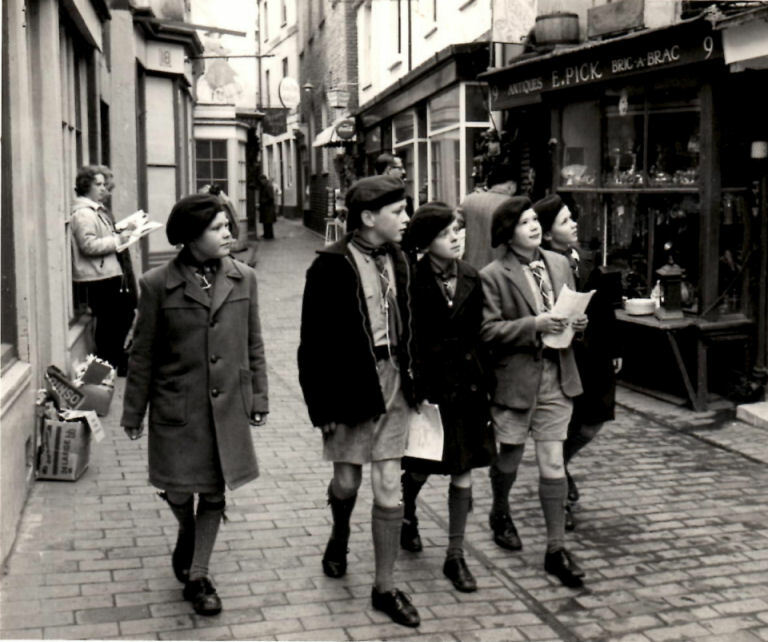 The first photograph is of myself, holding a paper, and my patrol ( Eagle), taking part in the Dolphin Quest organised for all scouts in Brighton over the Easter holiday of 1963. The object was to collect information about Brighton from various clues and photographs. At the time I was in the 19th Brighton ( Kipling’s Own) Troop. We had been formed earlier that year, I think, from the amalgamation of the 23rd Brighton ( Rottingdean) and the 49th Brighton troops. The 23rd Brighton, which I belonged to, met in the church hall of the Church of the Holy Cross in Warren Road, Woodingdean, despite having ‘Rottingdean’ as part of our name. The newly formed 19th Troop met in the hall of the Rudyard Kipling School in Chalkland Rise. The troop leader was John Brookes and the Scoutmaster was Dave Billham. The second picture may again be of interest as it was really a consequence of the 1963 Dolphin Quest. It was decided that the Dolphin Quest of 1963 was such a success that a subsequent quest was organised the following year, 1964, but took place in Holland. Again it was held over the Easter holiday. The second photograph, outside the Royal Pavilion, the designated departure point, shows a group of which I am far left, with our leader Bryan Moody who was a leading light in the scout movement in the 1960s. We are all wearing uniform knitted woollen hats in Brighton colours of blue and white. All scouts in Brighton were invited to take part and most Brighton Troops sent representatives. 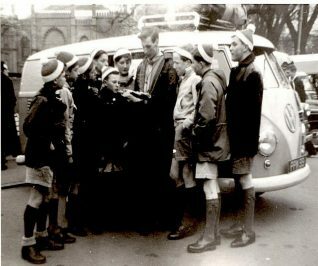 Over in Holland we were based with a scout troop in the town of Bussum, not far from Amsterdam and all those taking part were awarded a miniature clog. I have still got mine. I am sure I took part in the Dolphin Quest (or a similar name) in either 1964 or 65. We had 72 hours from Friday night until Monday night to undertake a series of tasks. There were teams of three and in the 4th Brighton Scouts we split into a pair – Dave and Jim, with me single. I took a train to Southampton and attempted one of the tasks (to sleep in a police cell) but the police were having none of it. Eventually I hitched through the night (I was only 15!) down to Devon, as two other tasks were a stick of rock from Barnstable (or Ilfracombe?) and a postcard of Dartmoor prison. That was where I slept in a police cell (in Princeton police station). I then hitched (pre-M5) up to Bristol but could not get evidence of going down a coalmine … as the Severn Bridge was under construction and the old Aust Ferry was not running that morning. I cannot remember all the tasks but I know Dave and Jim ended up in Ashby-de-la-Zouch (“find the exact centre of England”). We came second!